Plug the rice cooker into an electrical outlet. Press the "Cook" button once for regular cooking or twice for rapid cooking. The rice will cook until it is done. Once done, the rice cooker will beep five times, indicating the rice is done and the machine is entering "Warm" mode. 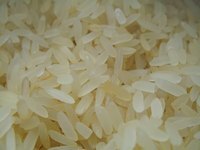 Unless you turn the cooker off, the warm mode will keep rice warm for 30 hours.